Room for one more festive treat? Normally we wouldn't be reviewing a game like Bubble Seasons on the third day of the New Year and for a couple of very good reasons. First of all, a quick glance at a screenshot makes it pretty obvious that this is a particularly festive-themed puzzle title, and it's probably not escaped the attention of either you or your wallet that Christmas has been and gone. Secondly, it features the kind of bubble-popping, cannon-fire gameplay that you've probably played more than a few times before. The thing is, it's really quite a good take on this classic gameplay. There are around forty levels in total, each filled with a collection of colored bubbles. Tapping near any of these bubbles fires a cannon which shoots a colored ball towards your chosen target. Match up three or more colors together and they'll vanish, topping up your score and letting any bubbles hanging from the cluster fall below the screen for yet more points. So the gameplay might be a little familiar but there's a few extra little touches that help make Bubble Seasons stand out. 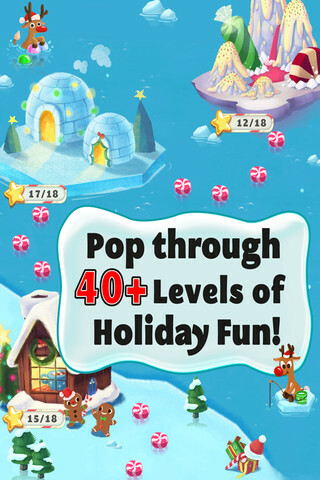 For a start, you can only complete a level by freeing the little creatures dotted around the screen. 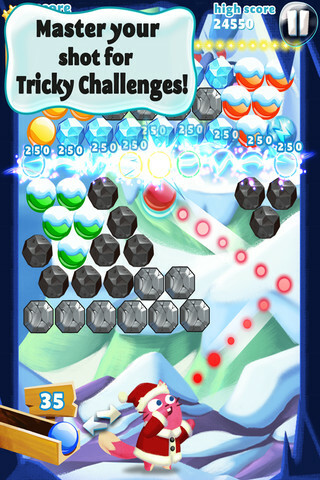 Creating a match-up with their bubble color releases them from captivity, and you'll need to rescue each and every one to complete a level. Once you've got the early levels out of the way that's not as easy as it sounds, as you only have a fixed number of cannon-shots to achieve this goal. Some of the later levels in particular are wonderfully designed to force you to think several steps ahead so as to maximize your cascading damage and creep ever closer to those critters. To up the pressure, each attempt at a level costs one unit of your energy quota, and you'll need to be successful at a minimum two-star, points-based standard to have that energy refunded. Otherwise you'll need to head off to the cash store to buy some more, or simply wait for the energy bar to recharge over a period of time. You can also buy some gameplay upgrades in the store with real cash, or spend the coins you collect whenever you successfully pop or drop bubbles. These might give you a points multiplier for example, or you can spend some of the rare gems on an improved aim for the next attempt. They're not essential for mastering the game though, and at worst you might have to wait for an energy timer or two to refill before making progress. 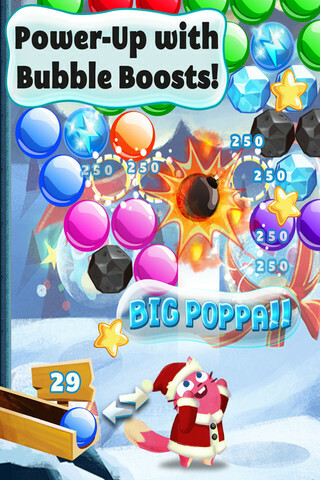 If you can tolerate the ever-so-slightly weird experience of playing this jingling, festively tuned game in the New Year, then Bubble Season will give you a pretty satisfying mental workout once you've progressed past the early stages. We'd much rather have splashed out a dollar or so to get greedily stuck into the puzzling feast, rather than be dependent on gems and energy timers, but there's more than enough content available up-front to get you through the first few days back at work. What's Hot: Some fiendishly designed levels spruce up this very traditional gameplay. What's Not: The energy system can halt progress rather sharply, and the game at its core is very familiar ground.